After another round of intense stomach virus sweeping the family our landscapers finally arrived to assist us in reviving what has long been the worst lawn in the entire city. In just a matter of time when the grass seed sprouts we should no longer be the embarrassment of the neighborhood! Elliott was thrilled about the landscapers being there and was quick to offer his amazing helping skills to sweeping off the driveway. 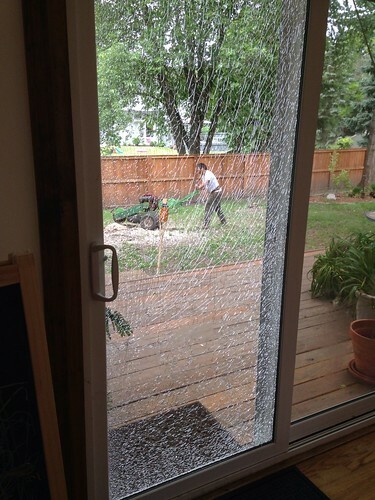 The landscaping was not without incident as the machine they used to grind down the tree stump kicked up a rock and shattered our glass door which will remain like this for several weeks until the replacement glass can be installed. In the meantime we've surrounded it, inside and out, with obstacles to avoid curious fingers poking at it. 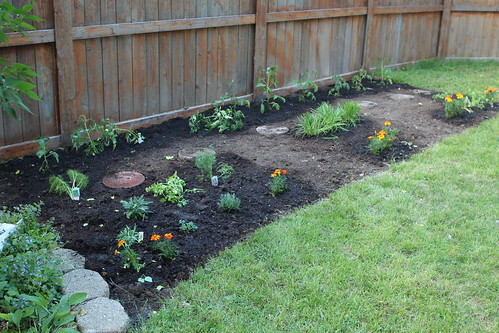 Jen and her mother took time to liberally fill our new garden plot with what is probably an extreme excess of tomato plants. 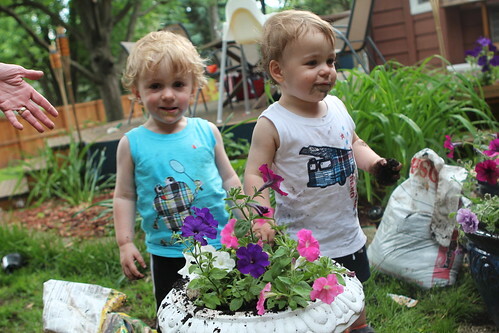 The guys were thrilled to assist their mother and grandmother in the potting of many plants. Elliott was even conscientious enough to taste the potting soil to make sure it was okay for the flowers. 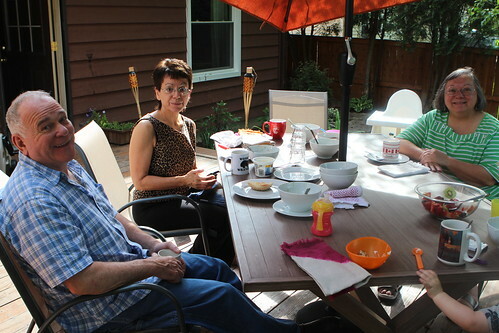 Last Friday my mother, Aunt Debbie, and Uncle Dave flew in to see the boys and this begun with a nice breakfast on the deck on Saturday morning. 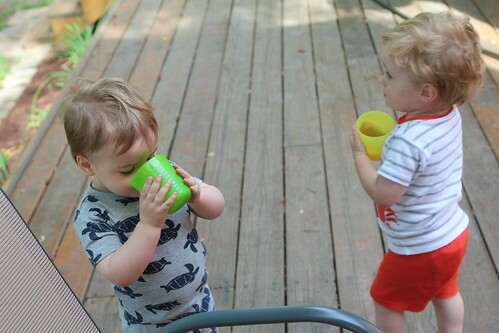 The boys worked on honing their cup drinking skills with some orange juice. 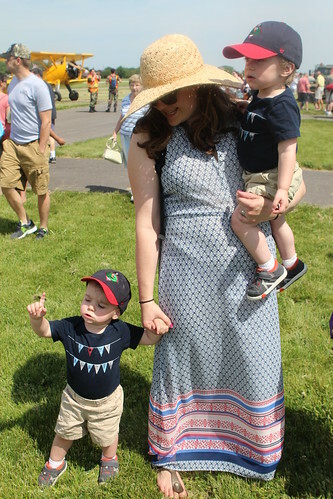 Later in the day we took the boys to the Cavalcade of Planes, an annual airshow at our local airport. This was, as expected, a pretty big hit. Toward the end of the trip Elliott took me on his own personal tour of the entire airport, starting with this small child's toy plane that he wanted. We ended up at a photo booth that I took him into that may have offered him significantly more confusion than delight. Later on we had a FaceTime call with aunt Pat. 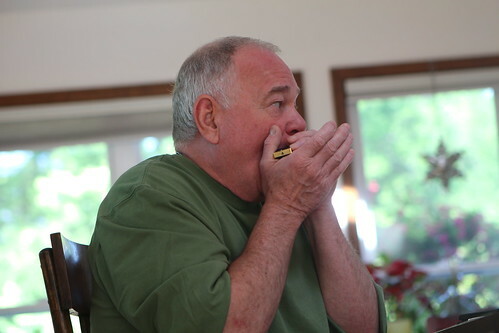 A huge hit was Uncle Dave breaking out his harmonicas and playing for the boys. He even had mini harmonicas for the boys which they took had mixed success with playing. They also had mixed success with learning how to use their spray bottles. 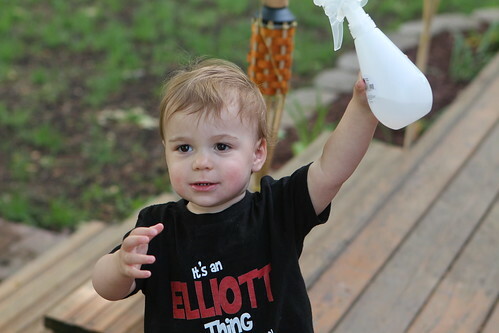 It took Elliott a long time to figure out how to not just repeatedly spray himself directly in the eye but once he got the hang of it there was no stopping him. 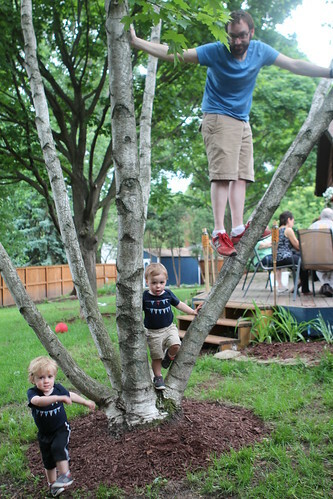 We also got a chance to attempt climbing the tree without getting stuck. I had slightly better luck with this than they did. During our Sunday night barbecue there a great deal of fun was found in dangerously racing around the decks in their Cozy Coupes. Though I suspected a differenc conclusion this game ended with no tears or injuries. 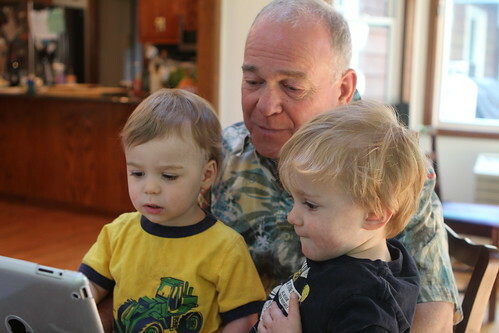 On Monday, before going to Day Care, the boys got to have a rousing story time session with Uncle Dave. 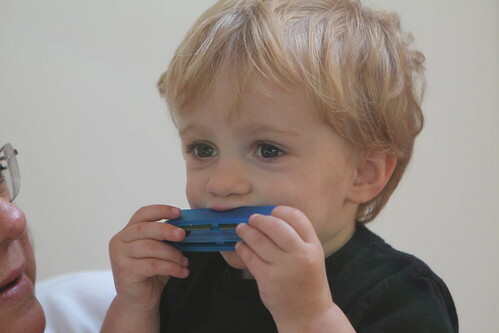 They would not go to day care without their harmonicas which they practiced the entire way there. Our neighbor, inspired by the boys' love for his motorcycle, got them some toy motorcycles which they could not have been happier about. Elliott did his best motorcycle impression while pushing the toy around the floor. In the past month I've been doing a lot of audio restoration of old projects I worked on from 1996 to 1998. 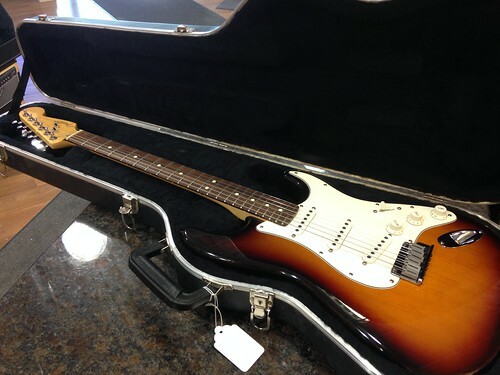 After digitizing them I began going to music stores to look at instruments that I want to buy in an effort to set up a small home studio. It has impressed me that in the decade or so since I have really spent any time in a music store that they have not changed at all. It's like a time warp into my past hearing people play obnoxiously loud and salesmen hungry for their commission. 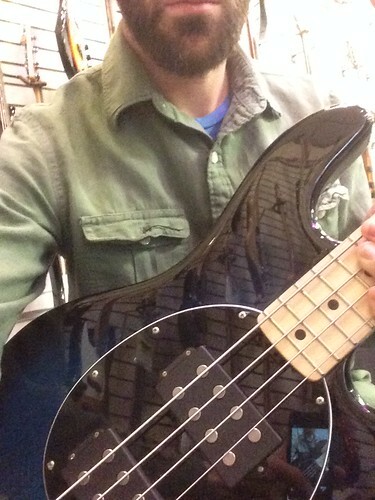 Still, playing some really nice instruments has been pretty refreshing. 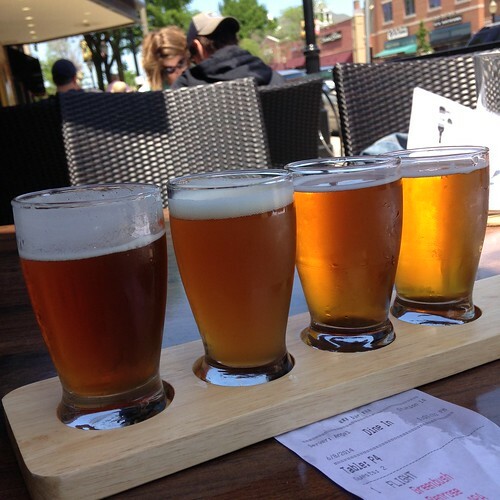 On Sunday for our anniversary we went to a place in LaGrange called "The Wild Monk" where we had some amazing beer and food. 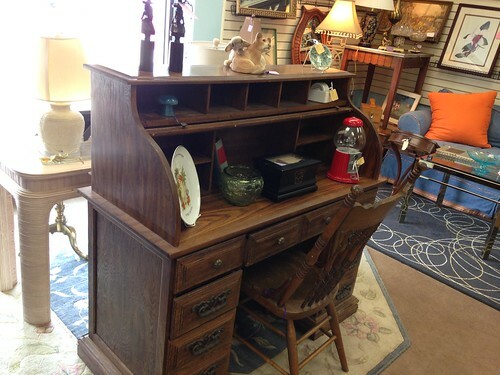 After lunch we took a stroll downtown and passed an antique shop with ridiculously low prices and Jen found this roll top desk that she fell in love with. The prices on everything were so low that we surmised upon returning it may have vanished and there may have been an old man there who informed us, "That there antique shop has been closed for forty years!" Despite this possibility we bought the desk. It wouldn't fit in our tiny Ford Fiesta so I made plans to return on Tuesday, my day off, with Lauren's car to pick it up. It didn't fit. And it was raining. 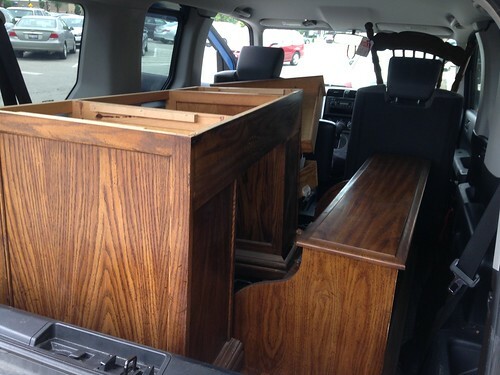 So I disassembled the unit, in the rain, while an elderly war veteran barked at me that his friend Carl had a desk even nicer than that for sale and that I probably paid too much for this one. I kindly informed him that I didn't know his friend Carl and, while that sounds like a hell of a deal, how on Earth would I have heard about it other than from some lonely geezer on the street. This is only because I respected him as a war veteran. If he was not a veteran I may have considered kicking him in the nuts. I leave you with two vidoes. One of a good, old fashioned game of peanut butter finger . . .
. . . and another of the boys playing harmonica instead of brushing their teeth. It's a good life they lead.